Yes, this is well possible as many airliners crews will confirm – they have been enjoying for many years the one hour drive from Almaty center to skiing resort Chymbulaq for some downhill skiing. 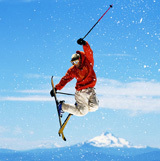 Of course, we offer more in our wintersports program. You will discover Almaty, have a chance to skate on legendary ice-skating rank Medeo (just beneath Chymbulaq) and will have a two day outing into Almaty Province. Staying overnight at a hot springs resort close to China and also enjoying a ride by a snow-scooter at Lake Issyk.